Marvin Hamlischs musical life is remarkable in its versatility. Best known as a composer, he has written major works for film, stage, recordings and concert halls. As a conductor, he has led great orchestras throughout the world, and as a pianist and entertainer, he performs both in ensembles and as a soloist. As a composer Mr. Hamlisch has won virtually every major award that exists: a Pulitzer Prize for A Chorus Line, three Oscars, four Grammies, two Emmys, a Tony and three Golden Globe awards. Among the Broadway shows he has composed are Theyre Playing Our Song and The Goodbye Girl. He is the composer of more than 40 motion picture scores including his Oscar-winning score and song The Way We Were and his adaptation of Scott Joplins music for The Sting, for which he received his third Oscar. Other film scores include original compositions or adaptations for Sophies Choice, Ordinary People, Ice Castles, The Swimmer, Three Men and a Baby, Take the Money and Run, Bananas and Save the Tiger. Mr. Hamlischs roots are in classical music, and in 1991 he composed the symphonic suite, "Anatomy of Peace," a symphony that supports the concept of one world, global understanding and peaceful co-existence. The music was premiered by the Dallas Symphony and has since been performed at Carnegie Hall, in Paris in commemoration of the 50th anniversary of D-Day and twice in London with the London Symphony Orchestra. 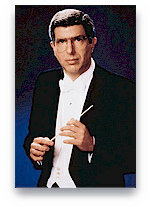 Mr. Hamlisch serves as Principal Pops Conductor with both the Pittsburgh Symphony and Baltimore Symphony Orchestras. He was the Musical Director and arranger for Barbra Streisands 1994 concert tour of the United States and England, as well as for her television special, Barbra Streisand: The Concert for which he received two Emmys. As one of the youngest students ever admitted to The Juilliard School, Mr. Hamlisch is a graduate of both Juilliard and Queens College. He believes strongly in the power of music: "Music can make a difference. There is a global nature to music, which has the potential to bring all people together. Music is truly the international language, and I hope to contribute by widening communication as much as I can." Mr. Hamlisch continues to be actively engaged in supporting various charities by giving benefit performances throughout the United States. He lives with his wife in New York City.